The mythical, mighty Dragon has never been more popular, reaching even greater heights with the epic series Game of Thrones and Khaleesi Daenerys Targaryen, Mother of the Dragons. 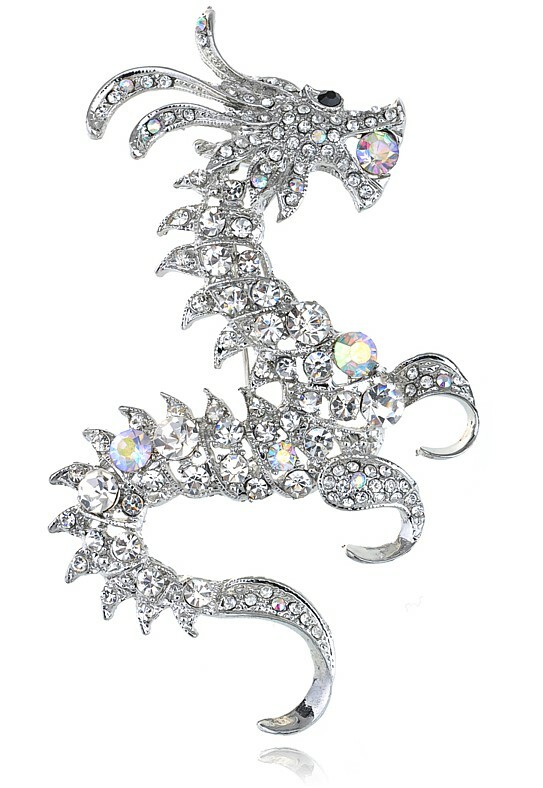 In homage to this beautiful character and spectacular story, MAJ brings fans - and those who are not yet involved in this mythical world - the exquisite Mistress Dragon Brooch. Measuring in at almost 10.5cm (4") this will make a stunning addition to any brooch collection. Created in high-class-utterly-dazzling-100%-wow-factor crystal clear and aurora borealis Czech crystals, this brilliant (literally) brooch commands an impressive postion on any lapel, pocket or hat where it will shimmer with every tiny movement, making compliments fly. This is a real talking point, especially for the majority of people obsessed with Game of Thrones!